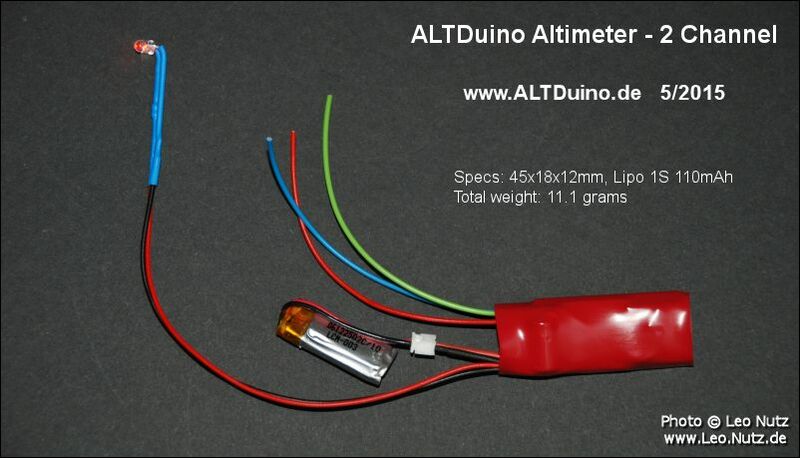 ALTDuino stands for ALTimeter ArDuino. The goal is to build a homemade altimeter specifically for model rockets that features low weight and must fit in an Estes BT-20 body tube (18mm dia).It must also be able to record a complete flight profil and have dual deployment recovery capabilities. Also, since I do not have the possibility of making my own PCB's all items need to be available on the market and at low cost. On the left is my Arduino UNO R3 which I use for testing purposes. It includes a MS5611 and an EEPROM 24LC512 mounted on a prototype board. On the right an assembled version of my ALTDuino Logger. I wrote the "ALTDuino Data Analyser" program to setup and optimize the firmware parameters for my ALTDuino altimeter. The "ALTDuino Unit Interface" is used to setup the ALTDuino and plot the recorded flight to screen. The above example is a simulated flight done by hand motion. Today was the long awaited first test run of my ALTDuino. It was enclosed in the payload section of my Estes Icarus that I have been flying since 1981. The liftoff weight of the rocket was 75 grams. An Estes B6-4 engine was used for this flight. My Estes Icarus ready for launch. The Icarus and it's payload after the flight with the ALTDuino blinking out the recorded altitude (apogee). The above graph shows the result of the successful logged flight. Apogee occurred at a little over 108 meters while the simulated drogue ejection was triggered at apox. 106 meters. It's a real nice feeling of accomplishment when viewing the graph after such a successful first test flight of my altimeter. Today was supposed to be the second test flight. The rocket pictured before launch. On the left my ALTDuino and on the right an Adrel Altimeter. Unfortunately the flight started out in a disaster but with an extremely lucky outcome. While the rocket was under full thrust the ejection charge prematurely set off. Due to the high forces the payload contents (ALTDuino and Adrel Altimeter) broke free and were scattered all over the erea! After a thorough search I was very very lucky to find both altimeters in the fields! The nose cone is still missing but I will look for it later. Update: After work I went back to the field and I'm happy to write that I was able to find the rocket nose cone. Luck was definately on my side. The next milestone for my ALTDuino was to take place inside a mid powered rocket. With this test I wanted to find out if the measurements at high velocity speeds would be accurately logged. Louis Schreyer, the maker of one of the best altimeters on the market (Louis' Rocketseiten) was kind enough to take my ALTDuino on-board his Altimax! rocket. I also included an Adrel altimeter for reference. Louis's rocket had his own Altimax Simply installed. It would take care of recovery duties. My ALTDuino and the Adrel would only be logging the flight. The "Altimax!" powered by a homemade rocket motor (class H) ready for takeoff. The flight was almost perfect. Main chute deployment failed due to the parachute having got stuck inside the body tube. Above is the profil of the flight logged by my ALTDuino. As you can imagine I was ecstatic after loading the data on to my laptop and seeing the beautiful flight presented on the screen. Everything went perfectly and to add to my delight, my ALTDuino and Louis's Altmax Simply measured the exact same altitude of 361 meters! The Adrel measured 366 meters. I'm a very happy camper to say the least. Because the high powered flight test was such a success I proceeded in the next step by adding a dual MOSFET device to the ALTDuino. It will take care of apogee and main chute recovery duties. A dual MOSFET switch plus two 10k smd resisters were soldered onto a small PCB. That intern was placed over the EEPROM chip to make for a compact a size as possible. The ALTDuino UI now supports velocity data ploted as graph. Project ALTDuino can now be found under it's own domain - www.ALTDuino.de. Today another big milestone was successfully completed with the main objective being the test of the MOSFET ejection hardware added to the ALTDuino. Again my old Estes Icarus was used for this important flight. As payload section I used a portion from an Estes Mongoose that housed the ALTDuino (a small prototype electronic bay) and the main parachute. To be on the safe side I decided to use an Estes B6-4 engine with a 4 second delay charge to deploy the first of two 12" parachutes. I did this in case the second parachute set to deploy by the ALTDuino at a preset height of 40 meters would fail. Liftoff was perfect with the powered flight being straight as an arrow and the rocket only landing several meters from the launch pad. The only problem occurred when the second parachute got tangled at deployment and didn't open. The ALTDuino ejected the main parachute making this test flight a complete success. Again another beautiful flight profil was captured by the ALTDuino. Because of todays successful test I felt it was time to protect the ALTDuino with shrink tubing. The finished ALTDuino as pictured above weighs 4.9 grams. The dimensions are 40mm x 18mm x 10mm. The altimeter has leads for 2 pyro charges and 1 lead for connecting to an external mounted LED. My first piece of hardware is now complete and working. I will now spend many more hours improving and tweaking the firmware. The final hardware test will consist of using an engine without ejection charge with the ALTDuino taking care of both apogee and main chute deployment. The big day, the days of all days, the pinnacle of all ALTDuino project tests took place at 06:30 AM this morning. A small field surrounded by woods in the southern part of Germany was the place where I would learn if all the work I put into this project would come to a successful major milestone. The Estes Mongoose that I had built just the night before stood poised for it's maiden voyage. On-board was my ALTDuino with a fully charged lipo and configured for drogue and main parachute deployment. Will it work...? Again I played it safe and decided to stick with a B size engine but this time without an ejection charge as it was not needed. I used an Estes B6-0 and filled the top with epoxy to prevent the hot gases from getting into the main rocket. The payload compartment had an Estes 12" parachute enclosed. The ALTDuino was set to discharge the first ejection at apogee separating the payload bay from the main body section and return under tumble recovery. The second recovery discharge was configured at a trigger height of 40 meters for deployment of the main parachute. The moment had arrived; Upon ignition everything went into motion and all I could do was watch and hope that every planned sequence would perform as designed. And that is exactly what happened! After liftoff the Mongoose rose to a height of just under 72 meters (236 feet) with the first deployment charge occuring just after apogee. The rocket then tumbled down until it had reached 40 meters (131 feet) where the second charge occurred deploying the main parachute. Some 8 seconds later the Estes Mongoose with it's valuable payload had safely returned back to earth. With this flight one of my biggest challenges has come to a very successful end. It was only in February of this year when I started this endeavour having to learn how to program in C+ and understand the hardware, in this case the Arduino platform. My goal was to finish this project in order to have my very own built and fully operational altimeter for a big event in South Carolina, USA. The purpose of today's flight was to confirm yesterdays successful launch, not that I had a lucky one timer. Additionally I selected a more powerful rocket engine for this launch; A C6-0 made by Weco in Germany was used for this flight. As with the flight from Friday everything went as it was suppose to. Drogue ejection went off just after apogee and main chute deployment at 40 meters (131 feet). The only unfortunate event was that the parachute got tangled in the shroud lines and never could open. However there was no damage to the rocket or the electronics. The major test phase of this project complete. Further work will consist of improvements and tweaks. It looks like I'm on a roll. I haven't flown so many rockets within such a short period of time before. I'm having fun. Todays goal was to fly another C powered Mongoose and hope that this time the parachute would open up. Well.... it didn't, again. Either it's the cool morning temperature or I need to reevaluate my parachute folding technique. However the ALTDuino worked flawlessly once more. I decided to launch the Mongoose one more time using a B6-0 so I could make some pictures of the flight. I also made some videos which I will post here at a later date. It occurred to me having made 2 flights that it would be a nice feature to overlap the graphs in the ALTDuino UI program so they could be compared. This will be my next program update. As I had 2 flights each of which having problems with the parachute not opening I launched the Mongoose this morning hoping a third try would be the charme. This time I used a different technique to pack the chute. I also modified apogee detection in the firmware so that the drogue charge event will be more accurate. The flight went very well. Separation of the rocket at apogee was spot on which indicates the improved modifications to the firmware worked as hoped. For some reason the achieved altitude was much lower compared to previous flights using the same type engine. This suggests the engine used on this flight was out of spec. Again the parachute struggled to open up at first but finally did so about 10 meters (32 feet) before touchdown, too low to be noticeable in the graph. I am now convinced this a temperature related issue as it was a chilly 7 celsius (44 fahrenheit) at launch which took place at 6:25 AM. The ALTDuino UI tool now has a "Compare" function making it possible to display and compare 2 flight profils. First via the "COMXX" or "Load" button you import the main flight profil. Then the "Compare" button is shown where a second flight profil can be imported into the UI (green graphs). I had four launches over the weekend. Two on Saturday (flight #10 and #11) and two on Sunday (flight #12 and #13). In the above graphs you can see one flight with a perfect rocket launch sequence. The first pyro charge went off at apogee and the second pyro charge went off at 40 meters with the parachute deploying bringing the rocket and it's cargo safely back to earth. The green altitude graph shows what happens when the main parachute opens prematurely. The parachute got pulled out by the nose cone that was too loose whilst the rocket went into tumble recovery. The weight difference is because the flight on the 19th had a small HD camera on-board. All flights have been a success with the ALTDuino deploying the recovery systems on each one of them. However on each of the last flights (flight #11 and #13) the ALTDuino rebooted after the second deployment charge had occurred. It became clear that triggering the 2 ejection channels directly from the battery was the cause of the reboots. When the battery was fully charged everything would work fine however when it was used by a flight before the current drain through the ejection sequence would bring the Lipo to it's knees. I therefore had to look for a simple solution to resolve the issue. The problem was solved by adding an electrolytic capacitor and a resister to the circuit. However, I did come run across a major error on my part. I was looking for a pin on the pro mini where I could grab direct voltage (+) from the lipo. I came across a pin called "RAW" and as it turned out it was what I was looking for. Since my lipo is hooked up to the same pins as with the FTDI board (VCC + GND) I measured VCC and RAW to be sure I had the correct pin. To my surprise this was not the case and then it hit me. To verify my fear I quickly checked the schematics of the Sparkfun Pro Mini which confirmed my big mistake. On the Sparkfun "raw" is the input (+) coming directly from the battery. This can be between 3.3V up to 12V whereas "VCC" input gets 3.3V only which bypasses the on-board voltage regulator. I then realized when using an external power source I had been powering my ALTDuino with unregulated voltage, in my case a fully charged lipo (4.10V)! Suffice to say I was extremely lucky that the components tolerated this and I was more than fortunate that my flight tests had worked under the conditions. In a nutshell I have to say I had more luck than sense! I finished the electronic bay for the ALTDuino one day before leaving for the States in preparation of Freedom Launch 2012 in South Carolina, USA. I built another altimeter and call it "ALTDuino Logger". I designed this altimeter version for logging purposes only. I'm in the USA right now and just finished the Estes Mongoose which is ready to be launched at Freedom Launch 2012 in South Carolina, USA. I modified the rocket for 3 stages however it will depend on the weather conditions at the launch site if it will fly in a 2 or 3 stage configuration. My Estes Mongoose had several successful flights at Freedom Launch 2012 in South Carolina, USA. I decided not to fly 3 stages as the winds were to high and I didn't want to risk losing the rocket and it's precious payload. That being said, I nonetheless lost it with 2 stages on it's last flight Sunday afternoon. Luckily on the next day it was sighted in the field and found it's way back to me thanks to the nice people at the rocket meet. For those interested, I'm using a key chain camera #16 HD with 120 degree lense taped to the rocket. The camera can be purchased on ebay. It's a fantastic little device! I've done a slight modification to the firmware since the last flights. The status LED seen in the video will turn on for 3 seconds at the 1st and 2nd ejection charge so each activation can be seen in the video sequence. At the Freedom Launch 2012 event in South Carolina I had the privilage of accompanying Jon on his level 3 certification attempt. I had asked Jon if my ALTDuino Logger could be aboard his rocket for the flight. He agreed. On the 1. September 2012 Jon's rocket soared into the sky reaching an altitude of 2433.30 meters (7983.27 feet) with a perfect flight and thus making a successful level 3 certification. The ALTDuino Logger performed perfectly. While on vacation in the USA I ordered Sparkfun's new Pro Micro - 3.3V/8MHz development board based on the ATmega32U4. This will be the next evolution and will be called ALTDuino II. The main advantages of this board compared to the Pro Mini is that you do not need an external FTDI board to connect to the computer. It will also make my life a bit easier concerning USB recognition status when communicating with the ALTDuino DA and UI programs. This flight was to confirm the modification to the firmware. The status led now turns on for 3 seconds when the deployment charges are activated, usefull for video analysing. The test flight took place in the morning under cold, cloudy and very damp conditions. I have implemented an exciting new feature to the firmware. The ALTDuino can now detect engine thrust cutoff thus making it possible to ignite the sustainer in mid flight and not having to reply on the booster engine to accomplish the task. The status LED will also signal the event with a 2 second flash. I plan on testing the new function this coming Saturday and afterwards I will know what tweaks might have to be made in the code. As I will have to modify the ALTDuino hardware first (a third FET output channel needs to be added to the board) the test will run via status LED only for now. Well, the tests that I had scheduled for yesterday at a model rocket meet in Straubing, Germany fell into the water. I did attend but I could not use my Estes Mongoose rocket under the bad conditions at the site. Today however was a different story. The weather was nearly perfect for the two test flights I had planed. The video below shows the result of flight #20. As soon as acceleration ends the LED lights up for 2 seconds signaling detection (and in the future ignition of the sustainer stage). As you look at the status LED you can observe that the thrust cutoff sequence was detected correctly. After having done more tweaks and making the sustainer ignition sequence in the firmware code more reliable it was time for another simulated test flight. Simulated simply means no actual ignition took place, data logging only. It was a beautiful morning to launch a rocket with the moon looking on to watch the happenings. In accordance with the changes to the ALTDuino firmware it was necessary to add the changes to the Unit Interface (UI) as well. The first thing was to incorporate the engine Thrust/Non-Thrust phases into the program. Also the red line (thrust) in the graph now ends at the point of engine cut-off and the yellow line taking over until the point of the first ejection charge is reached. Because the weather would be perfect again I prepared the Estes Mongoose the night before for another test flight. I want to be sure the thrust cutoff detection algorithm is working properly. Again a beautiful morning to launch a rocket and test the firmware. The flight profile was perfect and everything worked as it was suppose to. I am now building an appropriate booster stage with recovery capabilities and will use the Estes Mongoose as sustainer for the next test phases. I attended a model rocket event in Haid-Wessobrunn Germany. It is held every year to honor the works of Hans Held, a German pioneer in model rocket powered cars and airplanes. The ALTDuino had 2 flights aboard my Estes Mongoose. On both flights the altimeter functioned flawlessly. I have been doing some more work on the UI. New features include a zoom function by clicking the mouse on the graph. This will show a 3 second time frame at sample resolution. 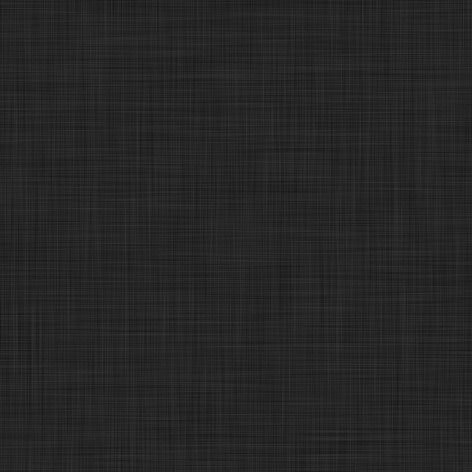 Above screen shot shows the graph zoomed in at the Thrust / Non-Thrust phase. I have also added the feature to read and write configuration settings between the ALTDuino and the UI. For example it is now possible to easily set the altitude for main deployment. I have written a setup window so that the altimeter can now be conveniently configured from within the UI. Select preparation time until the altimeter is "hot"
It is now possible to select a delay time for Apogee and Main deployment. Options are from 0 to 5 seconds with 1 second increments. Delayed sustainer ignition is now selectable by choosing a prefered velocity value. Options are 25 - 1000 meters/second at 25 m/s increments or 82 - 3280 feet/second at 82 ft/s increments. If the delay is set to "Max" then sustainer ignition will occur at maximum flight velocity upon booster thrust end. Playing around with these new delay options should prove very interesting and fun. I've changed the altitude read out from apogee to maximum recorded altitude. This change was needed because of the new delay option in the firmware. Before the change apogee was always triggered by default at the highest point in the flight. The Estes Mongoose has been a fantastic altimeter carrier throughout this project! Either as single or multi stage it has performed flawlessly. The only drawback is it's weight and drag because of the plastic fin unit with it's flat surface edges. Additionally the prefabricated body tubes can't handle moisture. That is why I built a model rocket for my ALTDuino altimeter to over come the drawbacks and limitations. I call it "ALTDuino-Rocks!" because I'm having a blast with this project. I have now placed decals on the rocket and have updated my post from Sunday, December 16, 2012 with an updated picture to show the result. Now I'm looking forward to it's maiden flight and with a new version of the firmware. I have been playing around with a liquid display. My intention is for it to be used at the field to readout additional information concerning setup and flight status figures. So far it's looking good. Their are lots of possibilities to be explored with the display. Today the "ALTDuino-Rocks! had it's maiden flight. The weather was good with only a slight breeze at times. However it was nippy at -1 Celsius (30.2 Fahrenheit). I had also made changes to the firmware so I was double nervous if all would work out. I was happy and relieved that everything worked out as expected. The rocket flew straight and high on a Weco C6-0P. The only nuisance was that I had yet again not fitted the nose cone tight enough to the body tube. The force from the drogue ejection charge also deployed the main chute. The rocket flew just under 186 meters (610 feet) with a max velocity of 51 meters/second (167 feet/second) at mach 0.15 (a new info feature in the UI). One major improvement is the increased precision of data output in the firmware for the ALTDuino UI. Actual measurements made during flight and data shown in the UI are now near identical. The weather conditions for this flight were far from optimal. Several inches of snow with at times strong winds and a temperature of -5 Celsius (23 Fahrenheit) made for nippy flying conditions. For this flight I'm testing firmware version 2.10b. The rocket had a HD camera on-board. Total liftoff weight was 106.8 grams (3.77 ounces). - Would the firmware function correctly? - Would the new rocket with the camera fly stable especially under the windy conditions? - Is the nose cone tight enough so the main parachute will not open prematurely? Well, I'm happy to write todays test was a complete success! Todays flight was not so much as to test the altimeter but rather to see if the smaller ejection canisters would be reliable. All past flights had shown that the ejection charges were oversized often causing premature main parachute deployment. I successfully did ground tests and was confident enough to try a launch for real flight confirmation. As you can see from the above graph the flight was a complete success. Above the statistics page of todays rocket flight. Outside temperature was -3° Celsius (26.6° Fahrenheit). There was no wind which made for a very high achieved altitude of 200 meters (656 feet). Todays flight was carried out to verify the small changes made to the baro sensor coding. It is now programmed for the highest precision in measurements when the temperature is below 20°C. In the video you can see in slow motion the engine igniting and lifting off. Outside temperature was -1.5° Celsius (29.3° Fahrenheit). The flight was straight and the rocket landed in soft snow just a couple of meters from the launch pad. The "main" flight was powered by an Estes C6-0 engine and rocket only. The "compare" flight was powered by a Weco C6-0 engine and the rocket also carried an on-board HD video camera. On the "compare" flight the parachute failed to open because it got wet and sticky due to the previous fight. Ambient air temperature was 3°Celsius (37°Fahrenheit). Firmware version 2.13 Beta was used on these flights. This time around 2 major test flights with increased sample rates were on the agenda. Up until now I was using 20 samples per second. Through improvements in the code I was able to increase the rate to 25 samples per second. As can be seen in the video, all the modifications done to the altimeter had performed flawlessly. I built a new lower section and dubbed the new rocket "Altduino-Rocks! 2". The section was painted at noon and I took it out to the field for it's maiden flight 5 hours later. The decals where placed on the rocket the next day. Yesterday was it's successful maiden flight. The altitude reached on the maiden flight was a surprise. I can only assume the Estes engine felt good on this flight. After having built the new rocket and successfully flown on the 18th I wanted to know if the fins were placed on straight to avoid any spinning during flight. That is why I strapped a video camera to the rocket to find out. I also wanted to see if my sustainer ignition code is working properly. Sadly on flight #41 the model rocket was lost in a South Carolinian cornfield. The simulated altitude was calculated at 550 meters (1804 feet). Everyone at the field lost sight of the rocket. Only at the last moment did one person get a glance of the rocket while it went in to the cornfield under it's parachute. After 2 hours searching we gave up looking. This essentially was another flight with the booster add-on to test the rocket for stability. I was asked to test a flight logger for a model rocket company. The logger is made by RC Logger. The firmware has a new function to allow staging ignition. This flight was to test the functionality of the firmware without actually having a staging event. The flight was perfect. All defined sequences occurred as programed. However, after downloading the flight data I got a small shock. Some data was missing at the end of the flight. Fortunately I quickly found the error in the code. I had mistakenly commented out the line that saves the altitude data after parachute deployment. I can't figure out how that happened but I'll make sure it won't happen again. Todays flight was to confirm the code fix is working fine and to test my new GPS transmitter that was mounted on the rocket. I wasn't totally happy with the GPS data from the last flight and I had issues trying to configure the device. My suspicions was that the blue tooth module I soldered on the receiver was causing interference. I therefore decided to remove the blue tooth module for this flight. My suspicions were confirmed as no interference was present this time round. Since this rocket is small (BT-50) and flies very high on Klima C6 engines I decided to add a streamer that deploys at apogee in order to make the decent more visible. It did help a little bit but not as much as I had hoped. As a bonus though you can now hear the rocket coming down due to the noise flutter of the streamer. Update: The rocket with both altimeters and a camera was recovered on the 14.03.2014. I did some major changes to the firmware concerning data filtering. I am no longer using a Kalman filter. Although all flights were successful more work needs to be done on the new filter algorithm. These flights were also done to test composite engine staging with limited success. Modifications to the data filtering section of the firmware have been improved since the last flights. Here is something that doesn't happen every day. 2 completely different flights ending up having the same maximum altitudes. Todays flight was to further test an idea for staging composite rocket engines. My trusted Estes Mongoose was again used and powered by a Klima C6-0 in the booster and an A4-P in the sustainer. After 74 successful flights with my ALTDuino altimeter this one would bring me back to reality due to my carelessness. Liftoff and stage ignition was completely successful so the objective was achieved. The flight continued. However I lost sight of the rocket because I concentrated on tracking the falling booster. After the booster hit the ground I tried to locate the falling sustainer in the sky but was unsuccessful. After a short period I finally heard a "pop" and then saw the parachute deploy. However the sustainer was not hanging under the chute. This meant the shock must have tore off. The rocket came in ballistic and landed in soft sand. The parachute compartment was crushed and will be shortend. The sustainer body tube has two dents and will be repaired. When the rocket reached apogee the pyro to deploy break-away recovery did not set off. The rocket came in ballistic and when it reached the preset altitude of 60 meters the second pyro to deploy the parachute set off. The shock cord tore as the parachute opened up at a very high decent rate. The cause was easily found after I had determined that the altimeter had performed perfectly and the wires leading to the igniter were intact. It turned out that I had poorly assembled the pyro igniter by shorting the lead wires inside the pyro capsule. That was very careless on my part! Two successful flights on a very windy day. On an extremely windy day two successful flights and one that went completely array... but not because of the altimeter. My "ALTDuino-Rocks! 2" has finally touched the skies again. It has to do with the launch that occurred on 14 December 2013. I certified NAR Level 1 in Orangeburg South Carolina, USA (flight #92). I used an Estes Nike Smoke and a CTI H-163 motor. Of course my altimeter was on-board. In preparation for my first 2-stage launch using the ALTDuino for in flight ignition I did optimizations to the firmware code. To play it safe I uploaded the modified firmware to my logger and used the proven firmware with my main altimeter. The test was configured for single flight. Both graphs are practically the same which means all is well. Next step is to simulate a 2-stage flight to test the rest of the optimized code. A couple of months back I had a "CATO" with the Estes Mongoose. I had to replace the complete yellow fin can and engine mount. Today was it's successful flight after the repairs and the Mongoose's 43rd flight in total. Todays flights were to test simulated 2 stage routine with the ALTDuino. They turned out to be quite successful and it's always cool to see 2 stage rockets in flight. I've done more improvements to the filtering algorithms. Yesterdays flight (#98) was to test the firmware in actual flight and I'm very happy with the results. Todays flight was the last 2 stage simulation test. I am now satisfied that stage ignition can be safely accomplished using the ALTDuino altimeter. On Monday I hit the 100th successful flight mark using my homemade altimeter. For the first time the second stage was ignited by means of the altimeter and it worked like a charm. The Estes Mongoose seen in the video below had it's 48th flight. At sustainer ignition the hot gases leaked through the two holes where the wires were going through the motor casings causing a hole in the booster stage. It was windy and the rocket weather-cocked quiet badly. However it was a good test for the altimeter. The rocket only reached 219 meters and landed further away than I would have wished for. This morning I decided to do another 2 stage test which was completely successful. I'm now confident in using this feature in high power 2 stage rockets. I also decided to fly my smallest ALTDuino rocket. I used a Klima C6-P motor which in previous flights sent the rocket over 300 meters high. Although the winds were light at ground level I did not realize they were very much stronger higher up. Well, I paid the price as the rocket landed in a tree 17 meters (56 feet) above the ground. I went to the landing site in the afternoon and began with the retrieval of the rocket. I needed all the luck in the world and got it! 3 hours later I had the rocket in my hands absolutely unscathed. My smallest ALTDuino-Rocks! rocket flew again on a Klima C6-P to a nice altitude of 320 meters (1050 feet). 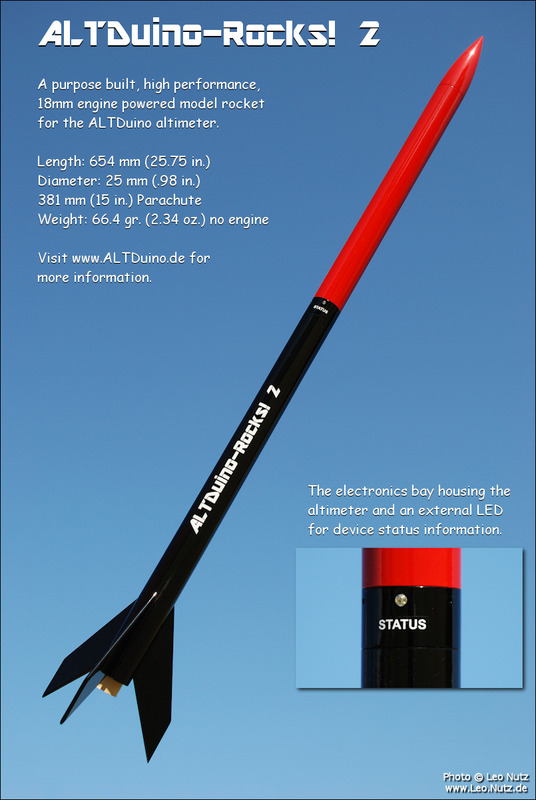 The BT-55 based ALTDuino rocket flew on a Klima D9-P and had a video cam on-board. This is the first flight using the combo of a Klima D9-P motor and my Estes Mongoose. The rocket flew a new personal altitude record of 444.45 meters (1457 feet) on a single stage. First flight of the weekend using my ALTDuino altimeter was with my Estes Mongoose. As always a picture perfect flight. I purchased 3 Estes Ascender kits and made a 2-stage rocket out of them. I also built an elektronics bay to house my altimeter for 2" diameter body tubes. The rocket was flown as a single stage to test all the functions before attempting the maiden 2-stage flight. On the second day of the weekend I flew my Estes Mongoose twice. Both flight were identical in setup and weight. Yet the achieved altitudes were far apart. This flight was the absolute highlight of the weekend for me. I think my most nervous time flying any model rocket to date. I had previously done 2-stage tests with my altimeter on the Estes Mongoose successfully. It was time to try my setup on a much larger 2-stage rocket. It was a wonderful flight and everything went out perfectly. The flight was a crowd-pleaser as well. Today I built a new logger called "ALTDuino Logger 2.0". It now not only logs altitude but also has an accelerometer and a magnetometer thus making it possible to accurately measure acceleration and G's. I will probably have it along at this years NSL 2015 in Orangeburg South Carolina. I finished building a new altimeter that I will be using with a 2-stage Estes Astron Elliptic II for dual deploy duties. The modified 2-stage Estes Ascender had it's second very successful flight, this time at NSL 2015 in Orangeburg SC, USA. I flew my Estes Flip Flyer and Estes Mongoose as single stage. On this rare occasion my brother Michael accompanied me and he enjoyed it. I flew my Estes Mongoose and ALTDuino-Rocks! 2 twice. I also flew my Estes Nike-Smoke. A flight the didn't fare too well as all the fins disintegrated during the boost phase. I attended an event in northern Germany and flew my altimeter on three occassions. First up was my ALTDuino-Rocks! 2 with a camera and a logger on-board. Later in the afternoon I flew the same rocket without the camera and logger. I also flew my Estes Mongoose which reached an altitude of 422 meters (1384 feet). The 2-stage Mongoose severely weathercoked resulting in a very low achieved altitude and premature deployment of the main parachute. Two flight to test new filter routines. After tweaking more code in the firmware I decided to do one last test flight before leaving for the USA next week to take part at NSL 2016 in Manchester, Tennessee and a ROSCO launch event in Camden, South Carolina. * Spam protect: Please type NzZkZ in the field and then your comment. Reference: Just Surfed On In! Hi, how do you (or through what do you) measure your time or how are you logging it? Very interesting! I am working something similar and stumbled across this awseome project. I will use it as a guide line. Do you have any other projects? Thanks. No other projects in this form. This is a personal project and publicized for inspiration to others. The altimeters can not be purchased. I've set up my altimeter so it can be used up to 36000 meters (118110 feet). However I will never come even close to those heights! It has Mach coding incorporated and should work with Mach 4-5, however it hasn't been tested yet. I like your web page and your analysis of your altimeter and flights. I was there at the Freedom Launch and others to see your rocket fly. I belong to this club that has since moved from Orangeburg to Camden, SC. Analysis is very detailed and concise along with your flights. Enjoyed flying with you and please come visit us again. what did you do to filter wind noises on ms6511 more than kalman filter? I have a throwing project like you and i have problem about isolating wind pressures from real pressure. I have my sensor on close area with just a little hole on it! should i use more hole to allow air to flow or not? You can reduce wind influence by using breathable foam and placing it over the sensor. If your sensor is in a compartment then it will be important to make sure that at least three holes evenly placed apart from each other are avaliable for more realistic pressure readings. The size of the holes depends on the volume of your compartment. You will never completely isolate wind pressure from real pressure. That is why filtering is important. I am 14 years old and am very interested in rocketry. I want to build a rocket that has composite motors and can only work with an altimeter like this. I was very excited to find your website and was very let down to see that it was not open source. Is this because you want to patent it? What is your reason for not posting the code and plans for the altimeter? If this was open source many young people like me could build more successful rockets and learn more about rocketry. Jeremy, welcome to the world of model rocketry. I used to visit Ocala for many years flying my planes and rockets at The Tri-County R/C flying field located in Dunnellon. Your questions have already been answered in other comments below. I'm sorry but I don't have any hardware for sale. Why are you not having you plans be open source? I understand you want to keep credit of your accomplishments but the community of arduino would gain so much by seeing how you devolved and improved. I was very saddened and discouraged to find out that building a system like this would be impractical for a person of my means without your code and plans. Thank you for providing this page but for everybody inspiring to do a project like this its dissipointing to see it not be as practical. I'm sorry for disappointing you but this isn't an opensource project. Just because I'm using some Arduino hardware doesn't mean I'm obligated to opensource it. I've mainly created this website to keep track of my progress throughout the project and I thought it can/would inspire others wanting to do something similar. hi there, im new to arduino but learning fast.. i am looking at building a complete package 10dof sensors and gps tracking radio transmission back to a hand held unit. i love what youve done here so far, and ive learned so much from you already. I'm glad my work gave you inspiration! Hi Leo, can you give us all programs please ? I'm sorry but my work is not open source. how do I acquire one of these data logging units? I'm sorry but these are not available on market. Very well documented progress. Have you considered internalizing the HD camera body? Also, please post details of the pyro used for the chute deployments as I am very interested in creating same. I have considered it often and have actually made some prototypes. Maybe I'll look back into it some time in the future. For now I'll simply stick the cam on the outside. I'll do a write-up on the pyro some time and let you know when it's done. Where can I buy shrink tube and magnet wire? I get the items at my local electronics store Conrad. Of course eBay is also a good source. May I ask what software you used to developed your UI? Very clean and well thought out. Thank you. I'm using Processing 2 for the UI. Did you have plans or board for sales ,or the instructions to build ? Thank you. I have no plans to open source this project. is 16kb enough to store the flight data? that completely depends on what you want to store as values to the device. Why did you chose the pro mini and not the micro? the wanted to use a system with 3.3 volts. The micro is only avaliable with 5 volts. Awesome! Which sensor do you use? I'm using a MS5611-01BA01 sensor. I have also tried the BMP085 sensor with very good results. It is less expensive than the MS5611. Love your work. I just scanned your page. Lots to read. 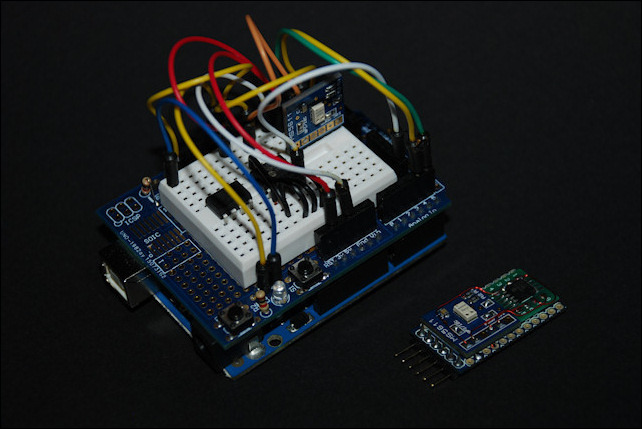 Are you planning to release schematics and program for your ALTDuino. The size of it is what I love. thanks for your work in the field. It will be helpful to those of use with less programming experience. Thank you. I have no plans to opensource this project. I'm trying to create something similar to your altduino. I was wondering if you could help me? I would love to buy the instructions to build my own! I've been using the sparkfun pro micro, but I would like to know if you would share with me your arduino code and possibly a wiring diagram? If you are not planning on selling the device could you supply the plans and shopping list so that I might build one of my own? I will credit your name and only use it for my Son and I. We have progressed into the High Power class now with the Sumo being our first High Power launch and I would love to get some electronics in all of our rockets but the systems that are "sold" online are just way too expensive. Have a look at this nice altimeter which only costs $40! I think a great deal and you can build it yourself. Awesome piece of tech, and I want one! Here, take my hard earned cash, TAKE IT. Thanks and I'd love to take your money but I'm afraid nothing is for sale. Sorry. I wrote some simple code for apogee detection for my own dual altimeter and I will be quite happy to share it with you if you send me your email. I am still waitting for the Arduino board that I have ordered but the code compile and the idea should be there. I have added my email address at the bottom of this web site. I got myself an Arduino board and a pressure Sensor (BMP085) and I was wondering if you could share your code so that I have something to play with. Obviousely this will have to be modified because I am using a different pressure sensor but I think that your code could be a good starting point. Boris, thanks for stopping by. I don't have any plans on releasing any of my codes in the foreseeable future. How did you calculate the velocity? Did you use any filtering (moving average, kalman filter, etc.)? The velocity is measured from each sample by using the Kalman filtered altitude readings. It's a bit crude and will need improvements and tweaks but it serves my purposes well for now. thanks for the links, the example code was new to me. Your resolution using the MS5611 is great! Would you mind giving more details about your sample rate and the code used to interface the MS5611 ? I am using OSR=4096 for the resolution at a sample rate of 20 measurements per second. Thanks Doug! The Arduino is a great plattform to learn and make stuff like this. Currently the last 20 entries are shown. Click here to view all 31 entries. This web site is maintained by Leo Nutz © Copyright 2012-2016.